Are you in need of a way to access the pressurized intake air system to install a boost gauge in your '98.5-'18 Dodge Cummins Turbo Diesel? If you made a mistake and bought your gauges elsewhere, you're still in luck. This adapter has a hole drilled through it that allows you to remove one of the intake manifold bolts that affixes the air intake to the cylinder head. Remove the bolt, replace it with Geno's Boost Adapter, and you now have access to pressurized air. Item worked just as described. Such a simple thing yet it makes things so much easier. I used this in my 08's 6.7 and it worked exactly as it was supposed to. I used a little Teflon when installing it. If you buy an electronic sending unit for your boost gauge (e.g. Isspro EV2), you'll need this item. The distance between the natural NPT port on the older 12v's to the p-pump is 1 7/8". The electronic gauge is 2 1/4" long. 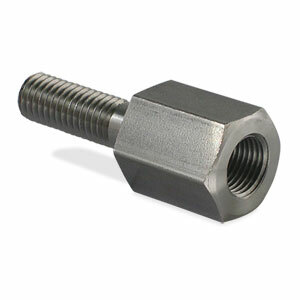 Using this boost bolt by cylinder #1 makes for an easy solution to installing your electronic gauge. I can always count on y'all for the best service and products for my Cummins. Thank you.